Read an open letter from the current NEACE President, Stephen Izzo. While winter has officially ended, it brought us another Super Bowl win from our beloved Patriots! Now that winter is over, I welcome Spring with open arms and we look forward to hosting our annual NEACE Spring Conference. This year's conference will be held at Ocean Edge Resort and Spa in Brewster Ma, from May 19th – 21st. This facility is a family friendly resort with over 400 acres to explore and enjoy. Warren Dews, our NEACE Executive Vice President, has put together an exciting program for the Spring Conference. Warren has been working hard securing some of the best speakers in the industry, who will present material relevant to the challenges we face today. Here is a preview of some of the speakers he has lined up. This year's theme is "Figuring out the Next Steps". Lori Gardner, along with our Board of Directors, has also been very busy coordinating the sales and marketing responsibilities related to our 2019 NEACE Buyer's Guide & securing sponsors. This book will be valuable resource for you to contact our vendors and network with colleagues throughout the industry. Please take some time to browse NEACE.COM for the latest information and be sure to like us on Facebook and follow us on Twitter. On behalf of the NEACE Board of Directors, I would like to express our gratitude to all of our members for the continued support of NEACE. It is an honor to be the 101st President of the NEACE organization. We have set up a Paypal account for those who like the ease of online payment. You don't need a Paypal account... you can pay with Visa Mastercard, AmEx or Discover. 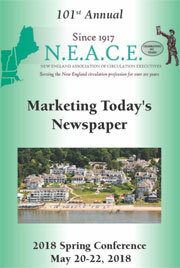 Are you part of our exclusive NEACEnews email list? Get connected with others in the circulation industry. Share ideas and best practices. Make success a common goal. Use the contact form to request that you be added. We'll need to know your name, email address, and member organization.